Been Enpass user for many years ..... and all upgrades have been reasonably straight forward. Yesterday Android phone icon on home page disappeared .... put it back and it run and advised it needed to upgrade to ver 6 - asked for master password - and rejected it twice. To avoid lock out - quit App. Restarted and this time on 2nd attempt it did work .. downloaded, then advised synch had to be reset up again and required DropBox username & password. Woah !!! never has this before ..... fails password 4 times, then wants new access details for my Dropbox ..... all sounding a bit suspicious - so stopped upgarde. 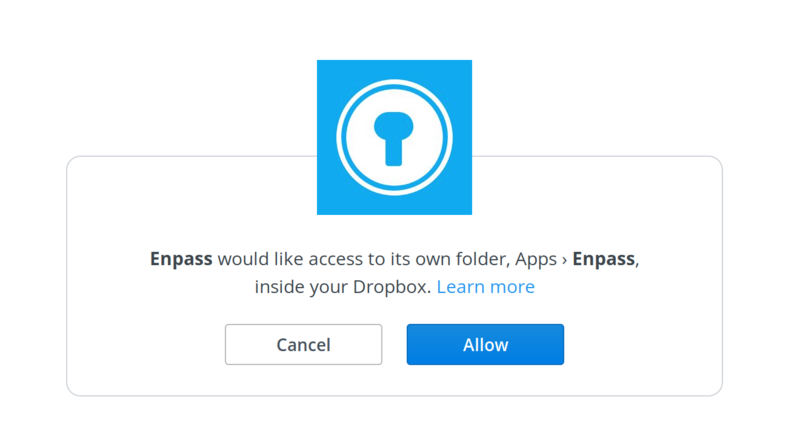 Has Enpass been breached - or is this complete new setup actually needed. Absolutely not. When you connect Enpass to dropbox, it requires only its own folder access. Please see attached screenshot. Can you share a screenshot of the said suspicious behavior.